Time to big up my city! Whilst I no longer live in Cardiff (I'm exiled in Caerphilly, feel free to shed a tear for me) I still work and play in Cardiff, most of my family and friends live there - it's home. If you want to get a glimpse of what us Cardiffians are up to, then a good place to start is We Are Cardiff, a blog written about the city by the people of the city. 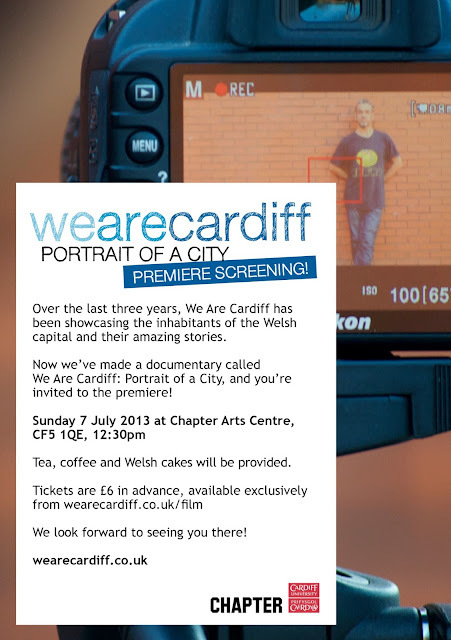 We Are Cardiff have spent a year and a half working on making a film and it's finally ready to be screened. The screening party is being held at Chapter Arts Centre (a place I urge you to check out) on Sunday 7 July at 12.30 pm. The folks who run We Are Cardiff would love to see you there. Tickets are available (in advance only) for the rather spiffing price of £6.00, and for that you'll find coffee, tea and of course, Welsh cakes in abundance. You can follow me on bloglovin' and twitter.